"Two girls, one fatal reading . . . because the truth always lies in the cards"
Skye's mother believes she has 'the gift' – the ability to see the future. Skye however can only see the opportunity to make money – and happily fleeces her gullible classmates into handing over their cash to hear their futures through Skye's well-worn tarot cards. But it's all for a good cause, right? Skye needs to save her hard-earned cash to go to New York with her best mate Drew. Then the local mayor's daughter, Paige, disappears – and Skye has a tip off about her whereabouts. Skye is uncomfortable about the source and masks the tip off as a vision. Eileen Cook is a multi-published author with her novels appearing in eight different languages. Her books have been optioned for film and TV. She spent most of her teen years wishing she were someone else or somewhere else, which is great training for a writer. Eileen lives in Vancouver with her husband and one very naughty dog and no longer wishes to be anyone or anywhere else. 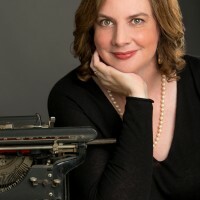 Follow Eileen, her books, and the things that strike her as funny at www.eileencook.com or on Twitter: @Eileenwriter.